If a few years ago someone had said Brussels Sprouts would end up being one of my favorite vegetables, that person would have ended up on my crazy list! While I’ve never been a truly picky eater, things like peas and Brussels Sprouts were just not my thing. By the way, green peas are still not my thing. Nowadays, if Brussels Sprouts are on a restaurant menu, you bet I’m ordering them. And I almost always throw them into the cart during my weekly grocery runs. It’s funny how things change over time…even your taste buds! How and why did I change my mind you ask? Well, for one, I was introduced to something called ‘roasting vegetables’ (i.e. turn on your oven and cook your veggies). And two, I played around with different flavors until I found something I LOVED. You see, maple-roasted Brussels Sprouts taste like candied vegetables. They’re sweet and a little savory because of the black pepper, and they pair well with pretty much everything. I’ve been known to serve myself a huge bowl (or three) and call it lunch! SO good! And you guys know how I like to use the husband test before sharing any of my own recipes on MIS. Well, this one passes that test every single time! Vishnu’s a huge fan of roasted vegetables as it is, but when I make these specific Brussels Sprouts, he eats them straight off the baking sheet. I highly recommend you welcome this delicious veggie into your home with open arms! When combined with a tiny bit of olive oil, a little maple syrup, and a dash of salt & pepper, the Brussels Sprouts take on a delicious, caramelized life of their own. You’ve got to try it to believe it! 2. Combine all ingredients in a medium bowl. Using cleaning hands, ensure Brussels Sprouts are evenly coated. 3. 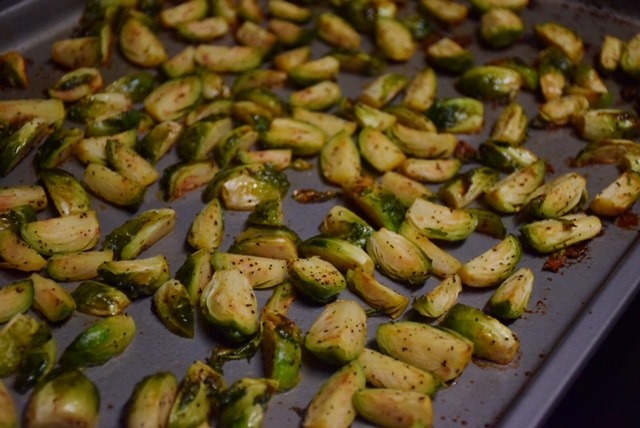 Place Brussels Sprouts in a single layer on a well greased large baking sheet. What’s one vegetable you thought you hated as a kid (or well into your adult life) and love now? 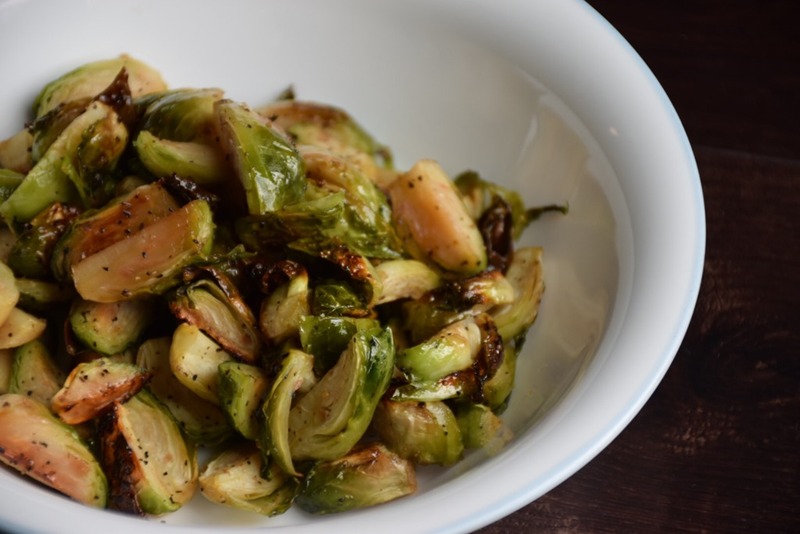 roasted brussels sprouts are my fav veggie, gonna try them like this next time i make them! delish! YUM- I know I would love this….I’m yet to come across a roasted vegetable I don’t enjoy eating! Growing up, I hated vegetables. Unless it wasn’t covered in cheese or puff pastry, eating them was just not a pleasurable experience. Clearly I am more than making up for that now and I don’t mind one bit :)! I could eat brussels all day every day. These look great! This is a nice Fall recipe and addition to a Thanksgiving table. I wasn’t a big fan of brussels sprouts until a few years ago when someone made it for a dinner party I was attending. I think her recipe was a bit similar to yours. I have always been thinking of trying it out, but just never got around to it. I was wondering… what did you pair with your brussels sprouts? I’m not sure how to incorporate it into a veggie dinner menu. 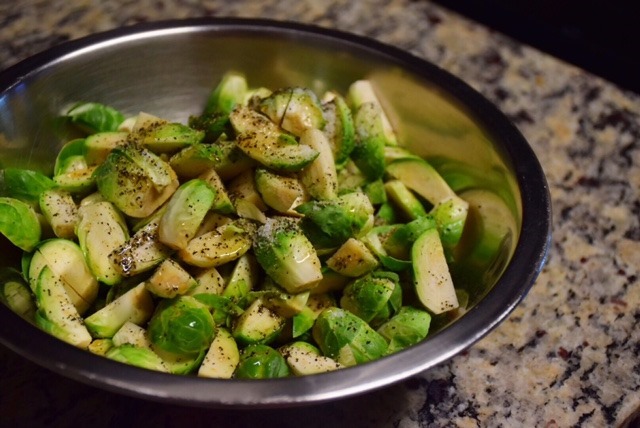 We usually cook brussels sprouts in a pan with olive oil and salt/pepper. I am definitely going to have to try your recipe, it looks good!